Niagara Falls, NY - They Keep Giving: Niagara Falls Fire Department Battalion Chief Clifford Mayes gives blood with the help of Pheresis Specialist Lashawnda Grat. 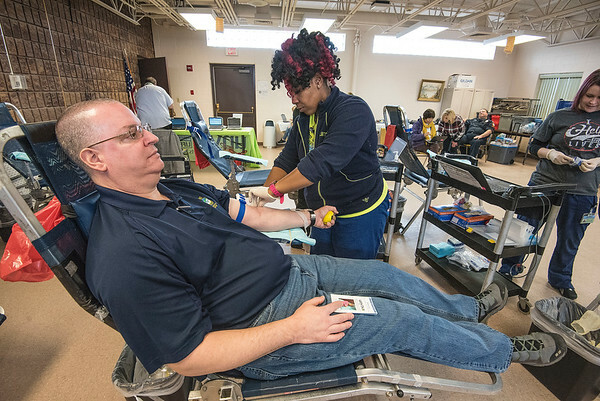 Unyts community blood center held a Holiday Heroes First Responders Blood Drive at the John Duke Senior Center on Thursday. Unyts will set up shop at the Niagara County Sheriff's Department training center at 5526 Niagara Street on January 10, from 10 a.m. to 3 p.m. and the public is welcome to join the first responders in donating blood.